Home Power Systems has the staff and resources to provide professional service, maintenance and warranty repair for your standby generator. HPS has certified, factory trained technicians ready to support you and the product we installed, or generators installed by someone else. Local 24hr Emergency Service is also available to our Central & Western New York customer base by calling us at 877-421-0203. Home Power Systems is a PowerPro Premier level Generac generator dealer, as well as a factory authorized dealer for Kohler and Briggs & Stratton/GE generators! We currently have over 6,000 maintenance customers that have their standby generators serviced on an annual basis. Each Home Power Systems technician is factory trained and certified on all types of Generac/Guardian, Kohler and GE/Briggs & Stratton standby generators. Our knowledgeable and experienced technicians are ready to trouble shoot, repair, and perform routine preventive maintenance to keep your home power system operating at peak performance. Home Power Systems is pleased to now offering 1, 2 & 3 year preventive maintenance agreements for air-cooled generators. All prepaid maintenance agreements include a 10% discount on additional repairs and non-warranty related work for the duration of the agreement. * Pricing is based on Home Power Systems local air-cooled generator customers, in the Rochester and Syracuse, NY area. Please contact us for a maintenance plan on the liquid-cooled generators. For pricing in your area, speak with one of your local Authorized Generac Dealers. If you want to perform your own maintenance, please see our Generac Maintenance Kits page for pricing. 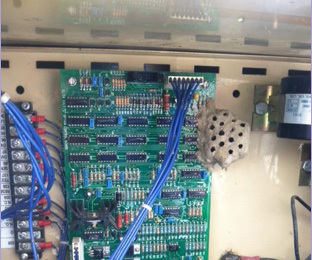 Rodents, ants and even a wasp nest can cripple your generator. Just one more reason why setting up an annual maintenance plan with Home Power Systems is so important! The installation of your Generac/Guardian standby generator only takes one day. What happens if it does not perform as designed? Home Power Systems stocks over $100k in parts and equipment in our Farmington and East Syracuse, NY facilities to perform emergency repairs so your power plant can be back on line in hours not days. Commissioning and startup on your new Generac generator is the most important part of the installation. This engine is being replaced because the original installation contractor did not follow the proper break-in and start-up procedure. Home Power Systems follows section 3.1 “Break-In Procedure” of the installation Manual to assure longevity of your new power plant. Home Power Systems warehouses between 80 and 100 generators in our distribution facility in Farmington and in East Syracuse, New York. This assures your generator is in stock and ready for installation. The picture at right shows just one rack of Generac generators ready for installation or shipment for online sales. So you don’t think your generator needs to be maintained! Take a look at the two pictures on the right. Snow storms, high winds and not paying attention to your generator is a recipe for failure. This generator would not have run for very long being completely covered by snow. The homeowner didn’t even know how bad his generator was covered. Home Power Systems provides complete maintenance services for your Generac/Guardian generator. Call us today! Sometimes warranty repairs need to be performed. As a consumer, you want to make sure this is done by a professional trained in the specific equipment they are working on. Home Power Systems has Generac factory trained technicians on staff to perform these repairs weather scheduled or unscheduled. Ask your current maintenance contractor if they have factory training on the generator or transfer switch they are working on. There is a good chance the answer will be no. Another reason to choose Home Power Systems….professional, reliable and offering the best value to it’s customers. Here is an example of how much damage can be done by not paying attention to your generator. In this particular instance, pigeons had nested inside of a rooftop generator and cause a huge mess inside! This is the recipe for failure for your stand-by power solution! Our Commercial Power Systems division performs service and repair on larger generators as well up to 150kw. This picture shows an engine replacement under way on an older 100kw Generac generator. The fault was identified during a scheduled maintenance visit. Make sure your standby solution is maintained on a regular basis.